La Nina brings an uncertain weather pattern to most of the state, as some southern counties fall into drought. (Trent Nelson | The Salt Lake Tribune) Skiers at Solitude Mountain Resort, Thursday December 21, 2017. Utah’s snowpack is looking anything but good — in some areas it is the lowest or second lowest it’s been in 30 years. That may not be news to skiers and snowboarders, who have been thrashing through brush and rocks for weeks. And if the weather pattern continues, it could spell trouble come summer if reservoirs fail to fill. Farmers and ranchers already are feeling some pain. A weak La Nina weather pattern has set up over the east-central Pacific, where surface water temperatures are lower than normal. Such a pattern typically provides extreme northern Utah more precipitation than average, Struthwolf explained. And it usually leaves southern Utah dryer than normal. Locations from Salt Lake City to Richfield could go either way. The La Nina also should bring above normal temperatures, except for the northernmost portions of Utah that are predicted to be average. Northern Utah ski resorts enjoyed two relatively good storms last week. But the three-week outlook doesn’t look good for precipitation, according to the weather service forecast: It will be dry. Week four, however, may provide storminess, forecast models indicate. Struthwolf noted that this winter season is shaping up like that of 1976-77, when there was little snow until March. Old timers may remember that ski season as practically nonexistent through February. But then Utah finally got whomped. In Salt Lake City that dry winter season was followed by 44.6 inches of snow in March, Struthwolf said. 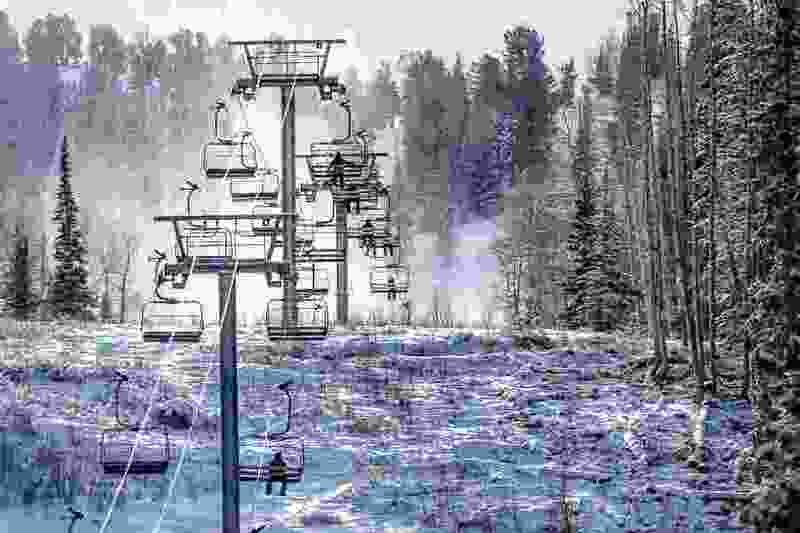 Presently, many mountain observation stations are reporting at their lowest or second lowest snow/water equivalent in three decades — mainly across central and southern Utah, according to the National Weather Service. The map of snow/water equivalents — the amount of water contained within the snowpack — provided by the Utah Snow Survey at the National Water and Climate Center, looks grim. Although Cache County is 96 percent of normal, the mountains east of Ogden in the Weber River drainage are just 70 percent of normal. And the further south you go, the worse it looks. The central and southern Wasatch are about 55 percent of normal, according to the Snow Survey. The north slope of the Uintas measures about 86 percent of normal. But the south slope is quite dry, with the Duchesne River basin rated at 63 percent of normal. And from the Price River and Sevier River drainages south, the snowpack is scant. Southwest Utah is 19 percent of normal, according to the Snow Survey. The Escalante River drainage is at 17 percent. And in the southeast, it’s a paltry 14 percent of normal. The U.S. Drought Monitor shows the far northeastern part of the state is normal. But from the northern tiers of Uintah and Duchesne counties through Summit and Salt Lake counties and on to Box Elder in the west, it is abnormally dry. To the south, almost the entire area of eastern and central Utah is in a moderate drought. While Kane County and portions of Washington, San Juan and Garfield counties are in severe drought, according to the Drought Monitor. Drought or not, Utah’s ski resorts will continue to make snow to keep runs open. It’s shaping up to be an unusual year in other ways. Despite the low snowpack, avalanche danger is high. That is the outcome of a weak base layer that is followed by relatively wet and heavy snow.